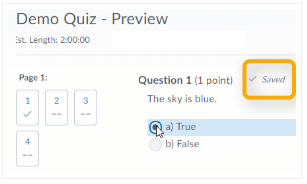 Brightspace quizzes now save automatically. For as long as you’ve used Brightspace, you’ve probably been told that when you’re writing a quiz, it’s crucial to save your answers as you go, to make sure that your work is saved if you’re interrupted. As of October 2018, it’s no longer necessary to need to manually save your answers when taking a quiz. Your responses will now be saved as you complete each question. See below for images showing the old version (with Save button) versus the new, including what it will look like when a question auto-saves. The old Brightspace quiz question interface, with Save button and disk icon (showing that the question is saved). There will still be a submission confirmation screen, after you click “Submit Quiz,” that prompts you to submit the quiz when you’re ready. If a Written Response question shows the format bar (also known as the HTML Editor), your responses will not be automatically saved as you type. To make sure that your question is being saved as you work, click anywhere outside the text entry field to prompt the “Saving…/Saved” message to appear at the top right. Other question types, or Written Response questions with the format bar disabled, will auto-save approximately every 30 seconds. You will now see a notification if you lose your internet connection while taking a quiz. You will also see a notification when the connection is restored, at which point Brightspace will automatically save any unsaved answers. If you’ve answered a question and it seems to be stuck on “Saving…” for a very long time, double-check your internet connection. If you seem to be connected, continue writing your quiz. Your answer will be saved when you either move between pages, or when you go to submit the quiz. As always, we generally recommend using a wired internet connection, if possible. This greatly reduces the chances of losing your internet connection in the middle of a quiz. If you’re writing a quiz from a mobile device like a phone or tablet, access the quiz from Assessments > Quizzes, rather than from Course Materials > Content. This will give you more room on the screen for quiz questions. If possible, use a desktop or laptop computer for taking quizzes, as these devices offer the best experience.